I’ve been complaining about researchers being too narrow. This article is a spectacular example. But it’s not just the lead author: everyone whose name is on the paper must be assumed to be equally ignorant and incurious – as well as the reviewers, and editors, and for that matter anyone who doesn’t stay up all night laughing at them. This is actually the second paper in only a matter of weeks from Wellcome Trust scientists that defies reason. Last month Ayub et al. claimed that the Kalash people of the Hindu Kush were an ancient north Eurasian population isolated from their neighbors for ~12,000 years. Check out my befuddlement here. The Armenian samples from the recent Haber et al. manuscript on the genetic history of Armenia are now freely available at the Wellcome Trust Sanger website here. 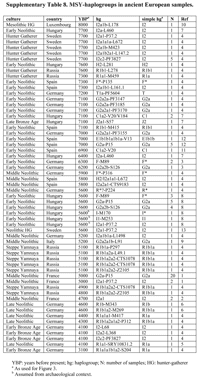 I ran an analysis of 127 of these Armenians using my K8 model, after removing a couple of the individuals from Chambarak with obvious European admixture, as well as a few other problem samples. The results are shown below, along with maps of the sampling locations (courtesy of Wikipedia). It seems that, at least based on this dataset, Armenians are a fairly homogenous bunch of people. The two groups from east of Lake Sevan show slightly higher levels of ANE than most of the rest, but this is in line with geography, because they're located a little closer to the Northeast Caucasus, where ANE peaks in West Eurasia at almost 30%. By the way, those of you having trouble with the acronyms in this and other recent blog posts, you'll find a list of often used Eurogenes acronyms here. I have a feeling that this generally underrated phenomenon will become much less underrated in the near future, and might even be recognized as a major factor in the formation of the modern European gene pool. Ancient human mobility at the individual level is conventionally studied by the diverse application of suitable techniques (e.g. aDNA, radiogenic strontium isotopes, as well as oxygen and lead isotopes) to either hard and/or soft tissues. However, the limited preservation of coexisting hard and soft human tissues hampers the possibilities of investigating high-resolution diachronic mobility periods in the life of a single individual. Here, we present the results of a multidisciplinary study of an exceptionally well preserved circa 3.400-year old Danish Bronze Age female find, known as the Egtved Girl. We applied biomolecular, biochemical and geochemical analyses to reconstruct her mobility and diet. We demonstrate that she originated from a place outside present day Denmark (the island of Bornholm excluded), and that she travelled back and forth over large distances during the final months of her life, while consuming a terrestrial diet with intervals of reduced protein intake. We also provide evidence that all her garments were made of non-locally produced wool. Our study advocates the huge potential of combining biomolecular and biogeochemical provenance tracer analyses to hard and soft tissues of a single ancient individual for the reconstruction of highresolution human mobility. Frei, K.M. et al. Tracing the dynamic life story of a Bronze Age Female. Sci. Rep. 5, 10431; doi: 10.1038/srep10431 (2015). At the transition from the third to the second millennium BC, the introduction of bronze for the manufacture of tools, weapons and personal ornaments marked a major step in European prehistory. Trade of the metal raw materials and manufactured goods required regular and organized contacts among communities. On the other hand, local population continuity was a prerequisite for the accumulation of wealth, the establishment of enduring social differentiation, and the formation of regional elites. The archeological record in the Lech Valley in southern Bavaria, Germany, shows a rapid and gapless transition from the Late Neolithic Bell Beaker Phenomenon to the Early Bronze Age. To investigate social and demographic changes associated with the appropriation of the bronze technology, we studied nearly eighty individuals from six burial sites in the region with respect to their maternally inherited mitochondrial DNA (mtDNA). The results indicate both local genetic continuity spanning the cultural transition, and, following the onset of the Early Bronze Age, a major influx of mtDNA types previously not found in this region. Integrating stable isotope data with the genetic data reveals a picture of a patrilocal society with remarkable mobility in women. While crucial for understanding the change of local demographics, these findings also have implications for the spread of major technological and societal changes across Europe at the beginning of the Bronze Age. York (Eboracum) was a provincial city at the edge of the Roman Empire where a number of Roman cemeteries have been excavated. One of these at Driffield Terrace is unusual in a regional and national context, with a large predominance (70.8%) of decapitated young males buried there. They show frequent evidence for trauma consistent with violent life histories and have been alternately speculated as gladiators, soldiers and slaves with potentially foreign origins. Here we report the ~1X genome sequences of seven of these individuals from the Roman period. While six of the Roman burials show affinity with modern British populations, one sample, although indistinguishable in funerary ritual from the other skeletons in the cemetery, shows a clear signal of exogenous origin, with modern affinities pointing towards the Eastern Mediterranean, a clear indication of the cosmopolitan impetus of the Roman empire, even at its western fringe. British population history is shaped by a series of immigration periods and associated changes in population structure. It is an open question to what extent these changes affect the genetic composition of the current British population. Here we present whole genome sequences generated from 10 individuals, found in archaeological excavations in Hinxton, Oakington and Linton, close to Cambridge, and ranging from 2,300 years before present (Iron Age) until 1,200 years before present (Anglo-Saxon period). We use modern genetic samples from the 1000 Genomes Project and additional external data from Britain, the Netherlands and Denmark to characterize the relationship of these ancient samples with contemporary British and other European populations. By analyzing the distribution of shared rare variants across ancient and modern individuals, we find that samples from the Anglo-Saxon period are relatively more closely related to central northern Europe, while earlier samples and contemporary British samples are relatively more closely related to Southern European populations. To quantify this series of relationships further, we developed a new method, rarecoal, that fits a demographic model parameterized by split times, population sizes and migration rates to the distribution of shared rare variants across a large number of modern and ancient individuals. We use rarecoal to estimate the history of European population structure within the last 10,000 years and to map our ancient samples onto the European population tree. Our approach provides a unique picture of population history in Europe, and in particular helps characterizing the complex genetic impact of Anglo-Saxon immigrations into Britain. The neolithization process swept over Europe after the advent of farming lifestyle in the Near East approximately 11,000 years ago. However, the mode of transition and its impact on the demographic patterns of Europe remains an area of open questions. Ancient genomics allow us to analyze individuals involved in these transitions directly and to make comparisons between populations over time. Previous studies have shown close relationships between early Scandinavian farmers and contemporary southern Europeans as well as strong differences between hunter gatherers and early farmers. However, mtDNA composition on the Iberian peninsula and different migration routes suggest a dissimilar history of southwestern Europe. We [obtained?] genomic sequences of eight between 4,000 and 5,600 year old early Iberian farmers from El Portalon, 15 km East of Burgos, Spain. In contrast to a 7,000 year old hunter gatherer from the near-by area La Brana, but similar to the pattern observed for central and northern European farmers, these individuals all show genetic similarities to modern-day southern Europeans, especially to Sardinians and Basques. Complete high-coverage individual genome sequences carry the maximum amount of information for reconstructing the evolutionary past of a species in the interplay between random genetic drift and natural selection. Here we present a novel dataset of 450 human genomes from 156 populations that represent a dense geographic coverage of Eurasia. The genomes, chosen to be representative of each population based on SNP-chip data, were sequenced at 40X on the same platform (Complete Genomics) and processed on a uniform bioinformatics pipeline. Our dataset has an unprecedented combination of high spatial and genomic coverage. This enabled us to refine current knowledge on continent-wide patterns of heterozygosity, long and short range gene flow, archaic admixture, and changes in effective population size over time. In particular, we have clarified the admixture dynamics of Eurasian populations during the last 3000 years, confirmed and further resolved the genetic relationship between recently sequenced ancient human remains and modern populations, and highlighted significantly higher amounts of Neanderthal gene flows in Island South East Asian and Oceanian populations. We have also assembled an extensive catalogue of genes under positive selection in various human groups. Finally, ChromoPainter (Lawson et al. 2012) and MSMC (Schiffels and Durbin 2014) have cemented genetic evidence of an early African origin for the people currently inhabiting Papua New Guinea. Our results are compatible with a first migration out of Africa of these Oceanian populations, which subsequently experienced 80% of gene flow from populations coming from the second, main Eurasian out of Africa. Denisovans are a sister-group of Neandertals that were described based on a nuclear genome sequence from a finger phalanx (Denisova 3) found in Denisova Cave, Altai Mountains. A molar (Denisova 4) found at the same site, has a mitochondrial (mt) DNA sequence similar to Denisova 3. Here we present nuclear DNA sequences from Denisova 4, with the morphological description and the mitochondrial and nuclear DNA sequences from another molar (Denisova 8) from Denisova Cave. Like Denisova 4, this molar is very large and lacks traits typical of Neandertals and modern humans. Nuclear DNA sequences from the two molars form a clade with Denisova 3. The nuclear DNA sequence diversity among the three Denisovans is comparable to that among six Neandertals but lower than that among present-day humans. The mtDNA of Denisova 8 is more diverged from and has accumulated fewer substitutions than the mtDNAs of the other two specimens suggesting that Denisovans were present in the cave over an extended period of time. Apart maybe from the first abstract below, I haven't been able to find anything jaw dropping yet. If anyone wants to help out, the abstract search engine is here. We developed the “Y-base” database, which includes frequencies of 500 Y-chromosomal haplogroups in 4200 populations worldwide, with total sample size 142,000. 130,000 Y-chromosomes came from 300 published papers and remaining 12,000 are our unpublished data. Using this dataset we created the world spatial distribution maps of 230 haplogroups. This World Atlas of Y-chromosomal variation was created by GeneGeo software, which we developed for digital map analysis in gene geography. The zones of sharp changes in frequencies were interpreted as genetic boundaries; the main boundary crosses Eurasia and includes not only mountain (Himalayas and Caucasus) but also steppe segments. The question arises to which degree patterns of Y-chromosomal variation agree with data on other genetic systems. To answer, we characterized all extant ethnic groups speaking Balto-Slavic languages by mitochondrial DNA (N=6,876), Y-chromosome (N=6,079) and genome-wide SNPs (N=296). We found that genetic distances, based on autosomal and Y-chromosomal loci, show a high correlation (0.9) both with each other and with geography but slightly lower correlation (0.7) with the mitochondrial DNA and linguistic affiliation. The high-throughput sequencing of the Y-chromosome reveals thousands phylogenetically informative SNPs. Population screening for these markers subdivides old haplogroups with subcontinental zones of spread into multiple young haplogroups with restricted areas - thus providing excellent tools for reconstructing population history. This approach allowed us successfully subdivide C2-M217, N1c-M178, and G1-M285 into 35 new subhaplogroups, to create their frequency distribution maps and estimate the SNP and STR mutation rate on the Y-chromosome. Introduction: Ancient DNA (aDNA) represents all types of DNA that can be recovered from archaeological and palaeontological material or museum specimens. Information from aDNA is very useful in phylogenetics, paleoanthropology or genealogy. The isolation and analysis of aDNA is accompanied by two major problems: low quality and quantity of aDNA and the risk of contamination with modern DNA. Therefore, several strict laboratory and methodological criteria must be followed. The aim of this study is to isolate and analyze aDNA from human remains of the small Avar-Slavic population living in 9th century and to determine mitochondrial haplogroups in order to estimate the ratio of haplogroups typical for these two ethnicities. Material and methods: The 50 samples of human teeth and bones were used for the isolation of aDNA in this experiment. 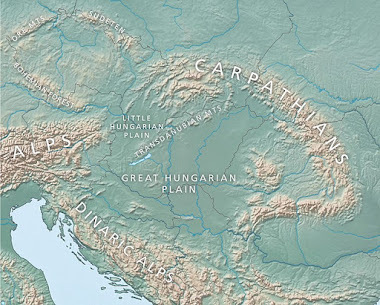 The samples were excavated from Avar-Slavic burial site located near Cífer-Pác (Slovakia). Isolation of aDNA were performed in recommended conditions. Mitochondrial haplogroups were determined by sequencing of the HVRI of mtDNA followed by analysis of polymorphisms in this region. Results: Despite the fact that the graves of mentioned burial place contained Avar artefacts and some remains showed mongoloid cranial features, majority of detected mitochondrial haplogroups belong to the common lineages of the Slavic populations and only presence of haplogroup U7 (typical for region of Near East) indicate the Avar origin. Conclusion: Our results suggest that the assimilation between Avars and other neighbour ethnicities was too extensive in 9th century and, therefore the presence of haplogroups characteristic for Avars is very rare. We analyzed a sample of the Volga-Ural region, including 462 individuals from 8 populations: Udmurts, Komi, Mordvinians, Mari, Besermyans, Chuvashes, Tatars, Bashkirs. We have shown that the major proportion of Y-chromosome haplogroups in the studied populations accounted for the four branches (R1b-M269, R1a-M198, N1c1-Tat and N1c2-P43), which together make up from 51% to 100% of the patrilineal genetic diversity in the studied region. We have shown that West Asian and Central Asian Y-chromosome haplogroup R1a-Z2125 in the Volga-Ural region occurs with the greatest frequency in Bashkirs (31%), which is the dominant subgroup of haplogroup R1a-M198 in this population despite the fact that in other populations Eastern European R1a-M558 and R1a-M458 are the dominant lines. This fact indicates that different haplogroup R1a-M198 lines in the populations of the Volga-Ural region have different sources. The Eastern European influence in the population can be also seen in Tatars from Tuimasinsky district of Bashlortostan in which typical for Central Europe haplogroup R1b-M405 is the predominant line of the haplogroup R1b-M343. According to the PCA analysis based on the Y-chromosome haplogroups distribution, Bashkirs show the greatest separation from other populations of the region. The reason is the presence with the high frequency of Asian lineages in their gene pool. Recently, a high number of Y chromosome SNPs has been discovered through next generation sequencing studies, but the geographic distribution for most of these variants remains largely unexplored. Haplogroup E is the most common human Y chromosome clade within Africa and its internal branches have been linked to a wide range of human movements. To increase the level of resolution of haplogroup E, we disclosed the phylogenetic relationships among 729 mutations found in 33 haplogroup DE Y-chromosomes sequenced at high coverage in previous studies and further dissected the E-M35 subclade by genotyping 62 informative markers in about 5000 samples from 118 worldwide populations. The phylogeny of haplogroup E showed novel features compared to the previous topology, including a new basal clade. Within haplogroup E-M35, we resolved basal polytomies and assigned all the E-M35* chromosomes to different new monophyletic clades. Through a Bayesian phylogeographic analysis, we associated each node of the tree to specific geographic areas. By this analysis, we identified a new E-M35 sub-Saharan clade, which originated about 11 kya in the northern part of the Horn of Africa. SNP-based dating, phylogenetic structuring and geographic distribution of this clade (and its sub-clades) are consistent with a multi-step dispersal of herders within eastern Africa and its subsequent diffusion to sub-equatorial areas. Our results provide new insights into the evolutionary hypotheses about the spread of pastoralism in Africa and increase the discriminative power of the E-M35 haplogroup for use in forensic genetics through the identification of new ancestry informative markers. Open access at Nature Communications today: Large-scale recent expansion of European patrilineages shown by population resequencing by Batini et al. Here, we use targeted NGS of European and Middle Eastern populations to show that Europe was affected by a major continent-wide expansion in patrilineages that post-dates the Neolithic transition. Resequencing at high coverage of 3.7 Mb of MSY DNA, in each of 334 males comprising 17 population samples, defines an unbiased phylogeny containing 5,996 high-confidence single-nucleotide polymorphisms (SNPs). Dating indicates that three major lineages (I1, R1a and R1b), accounting for 64% of the sampled chromosomes, have very recent coalescent times, ranging between 3.5 and 7.3 KYA. In demographic reconstructions (17) a continuous swathe of 13/17 populations from the Balkans to the British and Irish Isles share similar histories featuring a minimum effective population size ~2.1–4.2 KYA, followed by expansion to the present. Together with other data on maternally inherited mtDNA (16, 18) and autosomal DNA (19), our results indicate a recent widespread male-specific phenomenon that may point to social selection, and refocuses interest on the social and population structure of Bronze Age Europe. The shapes of different clades within the tree (Fig. 1a) vary greatly. Haplogroups E1b-M35, G2a-L31, I2-P215, J2-M172, L-M11 and T-M70 contain long branches with deep-rooting nodes, whereas I1-M253, N1c-M178, R1a-M198 and R1b-M269 show much shallower genealogies. The recent and rapid continent-wide demographic changes we observe suggest a remarkably widespread transition affecting paternal lineages. 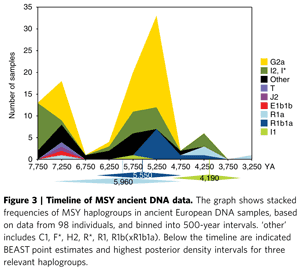 This picture is confirmed in an independent analysis of MSY diversity in the pooled HGDP CEPH panel European samples (16), and is compatible with current (n=98) ancient DNA data for MSY (Fig. 3; Supplementary Table 8), in which hgs R1a, R1b and I1 are absent or rare in sites dating before 5 KYA, whereas hgs G2a and I2 are prevalent. The period 4–5 KYA (the Early Bronze Age) is characterized by rapid and widespread change, involving changes in burial practices that might signify an emphasis on individuals or kin groups, the spread of horse riding, and the emergence of elites and developments in weaponry (35). In principle male-driven social selection (36) associated with these changes could have led to rapid local increases in the frequencies of introgressing haplogroups (34), and subsequent spread, as has been suggested for Asia (37). However, cultures across Europe remain diverse during this period; clarifying the temporal and geographical pattern of the shift will rely heavily on additional ancient DNA data. Batini, C. et al. 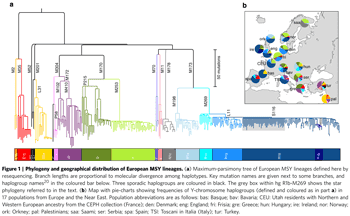 Large-scale recent expansion of European patrilineages shown by population resequencing. Nat. Commun. 6:7152 doi: 10.1038/ncomms8152 (2015). Some interesting stuff here from Allan R. Bomhard, especially in light of the ancient DNA we've seen recently from Late Neolithic/Early Bronze Age Europe. ABSTRACT: There have been numerous attempts to find relatives of Proto-Indo-European, not the least of which is the Indo-Uralic Hypothesis. According to this hypothesis, Proto-Indo-European and Proto-Uralic are alleged to descend from a common ancestor. However, attempts to prove this hypothesis have run into numerous difficulties. One difficulty concerns the inability to econstruct the ancestral morphological system in detail, and another concerns the rather small shared vocabulary. This latter problem is further complicated by the fact that many scholars think in terms of borrowing rather than inheritance. Moreover, the lack of agreement in vocabulary affects the ability to establish viable sound correspondences and rules of combinability. This paper will attempt to show that these and other difficulties are caused, at least in large part, by the question of the origins of the Indo-European parent language. Evidence will be presented to demonstrate that Proto-Indo-European is the result of the imposition of a Eurasiatic language — to use Greenberg’s term — on a population speaking one or more primordial Northwest Caucasian languages. Allan R. Bomhard, The Origins of Proto-Indo-European: The Caucasian Substrate Hypothesis. Paper to be presented at “The Precursors of Proto-Indo-European: the Indo-Hittite and Indo-Uralic Hypotheses”. Workshop to be held at the Leiden University Centre for Linguistics, Leiden, The Netherlands, 9—11 July 2015. Thanks to Eurogenes project member DESEUK1. A zip file with the R script, instructions and a couple of data sheets is available here. So let's model Poles as a bunch of ancient genomes from Central and Eastern Europe using output from my K8 analysis. Obviously the script can use ancestry proportions and/or population averages from any test, provided they're formatted properly. The accuracy of the modeling will depend on the quality of the input. Update 19/05/2015: A new version of the 4mix script that can run multiple targets is available here, courtesy of Open Genomes. It looks like we're about to see yet another paper on the origins of Ashkenazi Jews. A poster on the topic was presented this week at the Biology of Genomes conference, and is available for download here. It's a very reasonable effort, perhaps the best one so far. However, I'm of the opinion that the genetic structure of the Near East has changed significantly since the Neolithic. If that's correct, then using modern samples from the Near East to estimate Near Eastern ancestry in Ashkenazi Jews might not work too well. For instance, let's assume, just for the sake of argument, that ~2,000 years ago the Levant was home to a population genetically almost indistinguishable from present-day Cretans. This might mean that Ashkenazi Jews are much less than 50% European. But we won't know until we see some ancient DNA from the Near East, including from the remains of early Jews. James Xue, Itsik Pe’er, and Shai Carmi, The time and place of European gene flow into Ashkenazi Jews, Biology of Genomes 2015 poster presentation. It sounds to me as if Oase 1 is similar to Kostenki14 (see here), so I'd say there's a good chance its Y-chromosome belongs to haplogroup C-M130. 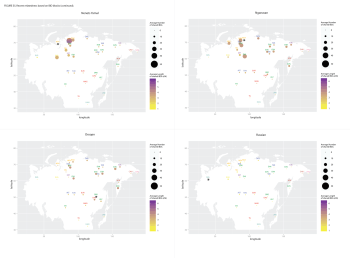 On a brighter note, here are some interesting Identity-by-Descent (IBD) maps from a very competent new preprint at bioRxiv on the admixture history of Siberians. You'll find the full collection in the paper's supp info PDF here. Furthermore, our results demonstrate that the European ancestry component detectable in many populations of southern, central, and northern Siberia is not the result of post-colonial Russian admixture as may have been expected  and as was suggested on the basis of ALDER analyses . Rather, with the exception of the Dolgans and the Samoyedic-speaking groups of western Siberia, the European ancestry represents one of the most ancient components [dating to not more than 4500 years ago] of the complex admixture history of Siberian populations. The ~4,500 YBP date makes a lot of sense. This is the Late Neolithic/Early Bronze Age period, which also saw massive population movements from the steppe deep into Europe (see here).